Until a few years ago, I hadn't given a thought to what our house number looked like, or any house number for that matter - they were purely practical things that just existed. However, I came down with a serious case of Front Of House Envy, when I spotted a house a few streets away, and besides it's gorgeous charcoal exterior, pale teal front door, and perfect hedge, the house number was gilded on the window above the front door, and I LOVED it. It was the house number that really sealed the deal, and I became ever so slightly obsessed, often going out of my way to walk past that house, just to admire the house number. Again. Kristen Cutlip is an artist and sign-writer who learned the art of glass gilding under the eye of Sandra Spannan, who is responsible for the gilded sign writing that graces Balthazar in New York, amongst many other Manhattan establishments and homes. Together they worked on the London branch of Balthazar, and Kristen continues to work on both commercial and domestic projects in and around London. Kristen happens to be a friend of ours, and when she heard that I wanted our house number done, she offered to do it. Ummmm, OKAY!!!! 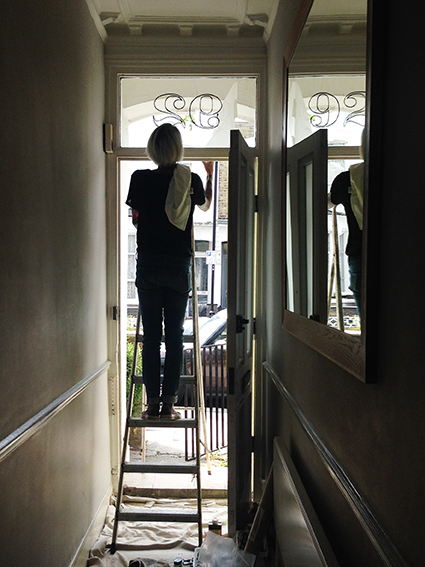 After six years or so, I was a bit concerned that the old window film I'd put on may have stuck permanently to the window, or be a total nightmare to get off, but it came off cleanly to make way for our very own golden numbers (yes, thanks Mr Hall). 'Transom' is the American term for the window above a door, however, there doesn't really seem to be a specific name for them here in the UK. They're sometimes referred to as a 'Fanlight' (if it's a fan shape), but I think I'll stick with 'the-window-above-the-front-door'. Stop me if I'm getting too technical. 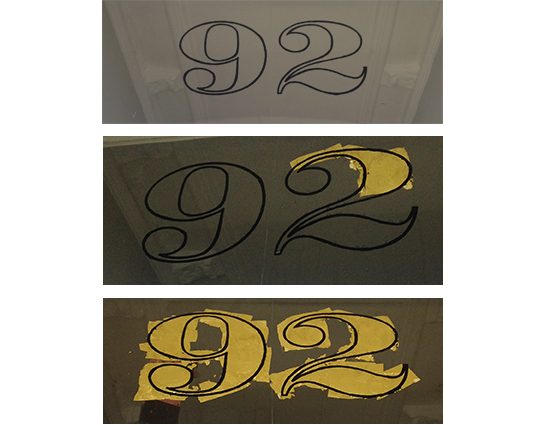 We had previously agreed on the typeface, size and colours - classic engravers font in real gold leaf, with a black outline, so the first step after making sure the window was squeaky clean, was to transfer the outline onto the inside of the window by hand, using black sign-writers enamel. There's quite a bit of drying time involved after each step, so I plied her with Matcha and croissants (of course). Next, the inside of the number is prepped with a gelatine mixture, before the gold leaf is applied. Once dry, the edges are cleaned up, and a gold enamel backing is layered on top of the gold-leaf to protect it and make sure no hairline cracks show up. This is then followed by a black coat (or it can be left as is, or matched to whatever outline colour you've chosen). Et Voila! A beautiful work of art, hand-painted, Front Of House Envy inducing, house number! Our beautiful new house number has inspired me to get my act together and sort out the bay window that is in desperate need of some TLC, and finish painting the door surround. When that's done I'll show you a proper before and after of the front of the house, but I wouldn't do the gilding justice revealing it in it's current state. Trust me. Meantime, you can contact Kristen if you want your 'window-above-the-front-door' number gilded, or any other gilding or sign-writing for that matter. The cost varies depending on the number and size (obviously a small number 1 won't take as long or as much gold-leaf as a large number 92), so it's best to phone for a quotation. Quick before one of your neighbours beats you to it!